Remember family game night when you were growing up; fighting over who got the prized Monopoly piece and trying to convince fellow players that your newly minted Scrabble “word” really did exist (I dare you to look it up…please don’t look it up)? Modern Boardshop is that experience, but so much cooler. 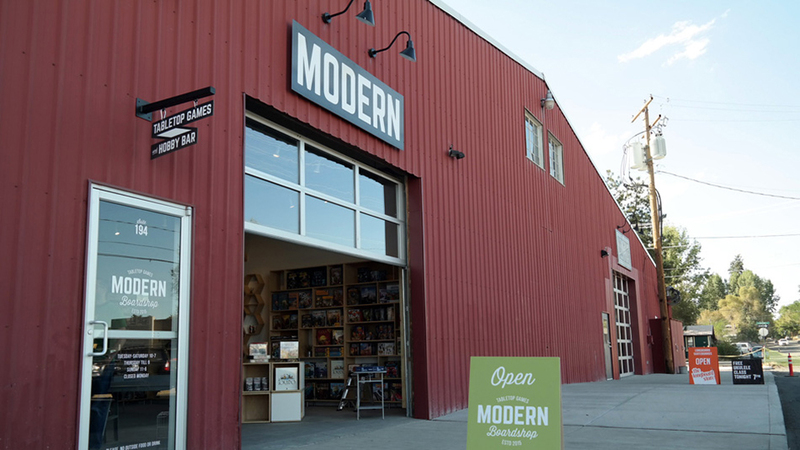 Located in Bend’s historic Box Factory in the Mill Quarter District, this place is a casual, well-designed, laid-back tabletop game shop and hobby bar. And by bar, they mean a place where you can drink a craft beer, cider, soda, or kombucha while you play your favorite board game. If you want to step up your game, Modern Boardshop stocks and sells the best brands in tabletop games, from modern board games and miniature games to role-playing games and collectable card games. You can even demo your game in the store first, just to make sure it’s going to be a hit. Or gather a few friends, or make some new ones in the shop, and play a game from the game library. Whatever your pleasure, Modern Boardshop is all fun and games Monday – Saturday from 11:00 a.m. – 6:00 p.m., Thursday and Friday from 11:00 a.m. – 9:00 p.m., and Sunday from 11:00 a.m. – 5:00 p.m.